"Most Americans living today never heard Ed Murrow in a live broadcast. This book is for them. I want them to know that broadcast journalism was established by someone with the highest standards. Tabloid crime stories, so much a part of the lust for ratings by today's news broadcasters, held no interest for Murrow. He did like Hollywood celebrities, but interviewed them for his entertainment programs; they had no place on his news programs. My book is focused on this life in journalism. I offer it in the hope that more people in and out to the news business will get to know Ed Murrow. Perhaps in time the descent from Murrow's principles can be reversed." -Bob EdwardsLong before the era of the news anchor, the pundit, and the mini-cam, one man blazed a trail that thousands would follow. Edwards brings to life the great stories Murrow covered and brought into American living rooms for the first time - the rooftop reports of the London Blitz, bombing raids over Berlin, and the 1954 broadcast that helped bring down Senator Joe McCarthy - as well as the ups and downs of his career at CBS. 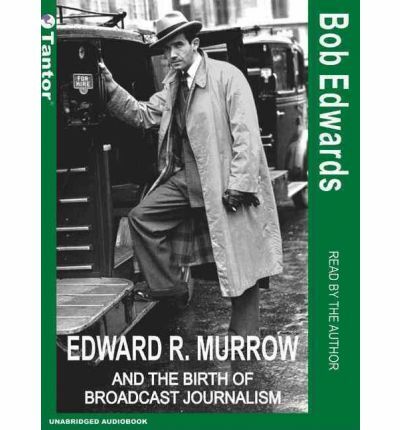 Edwards reveals how Murrow dramatically impacted public opinion and how the high standards he lived by influenced an entire generation of broadcasters. About the Author: BOB EDWARDS has hosted NPR's "Morning Edition," the most popular program in all broadcast media, since its premiere in November 1979. In 1999, he and the program received a prestigious Peabody Award for "two hours of daily entertainment expertly helmed by a man who embodies the essence of excellence in radio." Also a recipient of the Corporation for Public Broadcasting's Edward R. Murrow Award, he is the author of "Fridays with Red," which chronicled his radio friendship with legendary sportscaster Red Barber. Note: the format of this audiobook is mp3-cd. This means it will only run on computers with CD-ROM or DVD drives or CD players that are furnished to play mp3-cds. It can additionally be copied from a pc workstation to an mp3 player like an ipod sandisk rockbox sony or similar player.